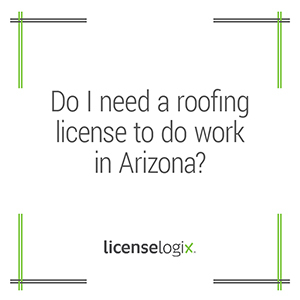 Do I need a roofing license to do work in Arizona? Yes. In Arizona you will need to be licensed with the State of Arizona Registrar of Contractors (ROC); Roofing is considered a specialty classification. The ROC was established in 1931 to promote quality construction by Arizona contractors through a licensing and regulatory system designed to protect the health, safety, and welfare of the public. A contractor’s license is issued for two years and must be renewed biennially. The specialty classification you would need will depend on whether you are doing residential work, commercial work or both. The specialty licensing classifications are further broken down into specific types of work. For example, "foam and foam panel roofing" is a separate classification than "roofing shingles and shakes". Arizona requires an examination for the specialty classifications as well as an Arizona Business Management examination. If you are already licensed in another state te ROC might not require you to take the examination. The ROC exercises license reciprocity with the California, Nevada and Utah State License Boards subject to certain limitations. The ROC retains the right to require a trade examination by any applicant/qualifier, regardless of current or previous licensure in the reciprocal state. The ROC will provide you with timely notification of pertinent changes that may affect the reciprocity agreement in any way, including but not limited to: changes in exam requirements, changes in experience requirements, classification consolidations ore deletions. Arizona may waive trade examinations for all licensed California, Utah and Nevada contractors in license classifications equivalent to those of Arizona. All applicants shall be required to pass the Arizona Business Management examination. In order to qualify for reciprocity you must meet specific qualifications by the ROC which can be found on the ROC website. You might also be required to file for sales tax, withholding tax and unemployment insurance. The licensing process can be confusing and time consuming. Doing it right the first time will help to relieve stress and avoid possible civil and criminal penalties for non-compliance with licensing. LicenseLogix can identify all of the licensing and registration requirements for your business, file the paperwork for the required examinations, submit all applications for registration and make sure you are setup for all state tax and general business license and registration requirements. For more information on how we can help click live support to chat online with a licensing expert, submit a question to a licensing expert, or just call us as (800) 292-0909. Once LicenseLogix has helped you become licensed in Arizona, we can help you to stay compliant with your license. LicenseLogix offers a license management solution called CLiC, that allows you to view all your existing licenses in your selected jurisdiction. You can run reports, view your application status, and see all renewal dates and associated state fees. When you are a CliC client you have the capability to order renewals with the click of a button or if we are already managing your renewals you can monitor your applications right online. You can request a CliC demo!